sticks and stones might break your bones, but cement pays homage to tradition. Being tiny has been difficult for me in a business that regarded physicality as the most important part of your life. I think they look upon me as an old child, because I'm so little. If love means never having to say you're sorry, then marriage means always having to say everything twice. She once said "The only time you'll see me as a Democrat is when I play Sophia. On August 1 2009 Estelle's tombstone was installed. " Betty White remarked "The only comfort at this moment is that although Estelle has moved on Sophia will always be with us. 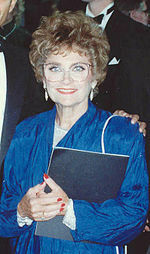 In her later years after retiring from acting Estelle Getty battled Lewy body dementia. She was best known for her role as Sophia Petrillo on The Golden Girls from 1985 to 1992 which won her an Emmy and a Golden Globe on The Golden Palace from 1992 to 1993 and on Empty Nest from 1993 to 1995.